Red Deer Advocate, November 19th, 2011. 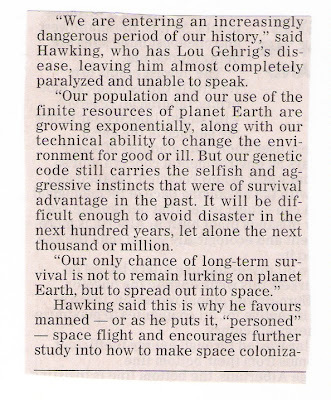 This news clip is the essential part of an article entitled, Our Only Hope: Colonize Space. 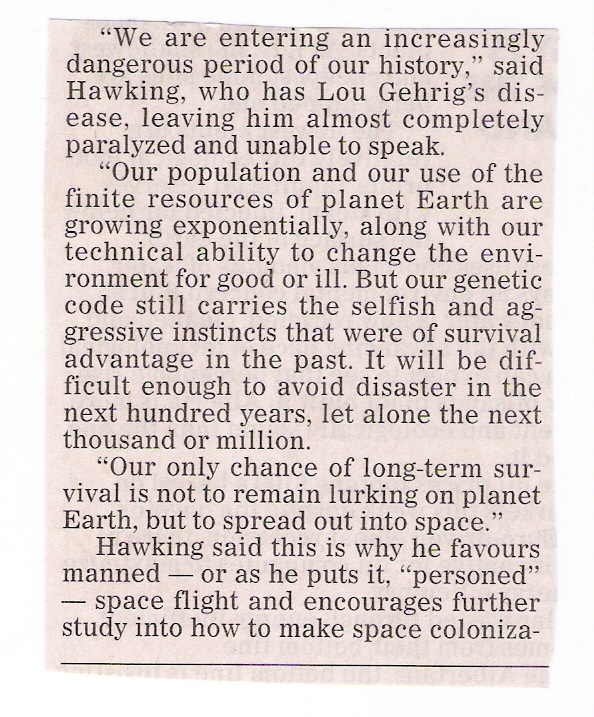 Space is man’s great hope for the future, according to physicist, Stephen Hawking. Colonization of space is a beautiful, grand dream. But God has a better plan. As huge and intriguing as space is, Mr. Hawking’s hope is a shortsighted one. The Bible says that we “look for new heavens and a new earth, wherein dwelleth righteousness” (2 Peter 3.13.) To clarify, that is what Christians look for. And this they look for because they are convinced that man is not able, because of his sinful self, to make life any more glorious and peaceful in space than he has been able to make it on earth. Mr. Hawking believes that man may yet evolve out of his ‘selfish and aggressive instincts.’ Christians believe that man has been selfish ever since Adam and Eve ate the forbidden fruit, aggressive since Cain killed Abel, and that these evil tendencies will continue until the Lord brings to conclusion this present dispensation of grace. “There are so many questions still to answer,” Mr. Hawking says near the end of this article. Yes, many, and the most elementary questions of all Mr. Hawking is still in the dark about. A fine man to be speculating on future hope! He still believes that selfishness and aggression are rooted in evolution and not sinful depravity! If there is no qualitative difference between humans and animals, as evolutionists assert, then we shouldn’t want to colonize space any more than the chickens do that we ate for supper! That is a logical deduction from the hypothesis that man is just an evolving animal. A non-spiritual, evolved monkey, which is what man is according to Darwinian Evolution, should live up to its low pedigree, and stay down on earth. Great men of the earth are hard of hearing when it comes to divine knowledge. “Not many wise men after the flesh, not many mighty, not many noble, are called” (1 Corinthians 1.26.) By God’s estimate, the carnal man who is brilliant must become a fool to become spiritually wise (1 Corinthians 3.18.) Then he may, with the spiritual eye of faith, look beyond the galaxies and beyond the space-time dimension, to the blessed hope that is ready to be revealed at the coming revelation of Jesus Christ.